Things are almost back to normal at our house after an eventful last week. Austen continued to play flag football and soccer (two games for soccer) this past weekend. Not sure that cast had any affect on his performance as he had a touchdown and two interceptions during football. Soccer he played up one level with the older kids and still scored two goals. For his own team, he led them to a significant win, scoring four goals. I would say there hasn't been any change in his performance on either field! As for Adler, there has been a change in her sleeping spot. I couldn't figure out why my newly carpeted stairs looked like they hadn't been vacuumed when my cleaning ladies had clearly just been there. It took me a few more days before I caught on that Adler had selected a new spot to sleep. It's a unique spot, halfway up our front stairs on a landing. 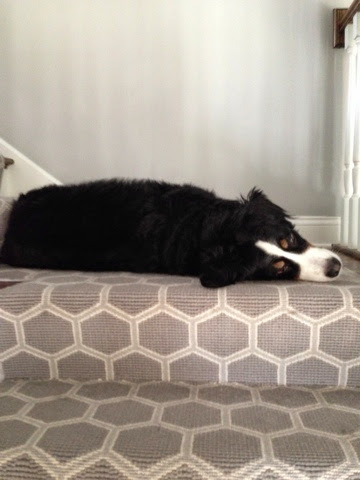 It's also a dangerous spot for us as she is in the way as we go up and down the stairs. But she clearly looks comfortable since she can hear what's going on downstairs as well as upstairs from her new location. I just hope she doesn't fall down the stairs if she rolls over in her sleep or causes us to fall down the stairs. We don't need anymore injuries at our house! 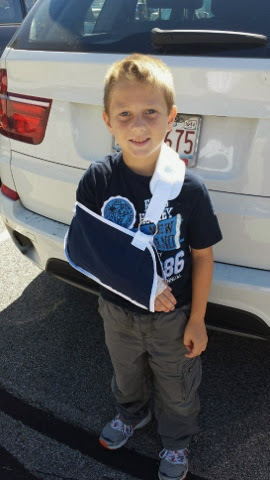 Austen fractures his arm in gym class on Monday (which they now only call PE and Austen promptly corrects me every opportunity he gets). I'm downtown so after I talk to the school nurse and relay all this information to Tom (who is local), he takes him to the urgent care to get an X-ray which shows he has a buckle fracture. There goes his fall sports season, I think. I am not sure who is going to be more disappointed, me or Austen. The games were just getting good too. The good news in all this is I found a orthopedist who would see him on Tuesday. 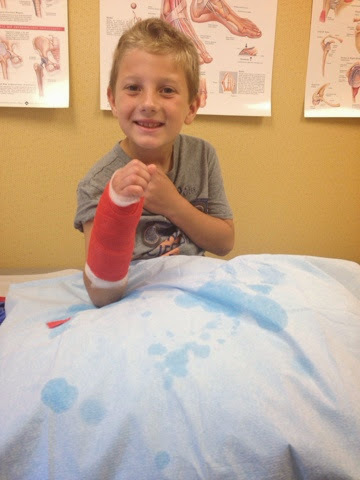 The one the urgent care referred us to only could see him on Friday, which seemed like a long time to wait for a cast. Anyway, everything had to be carefully orchestrated as our nanny uses my car during the day to take our kids to activities and Peyton had gymnastics and then had to be dropped off at school. If all went well, I could walk to school to get Austen and walk home with him (we live about a short walk away) and our nanny would just be getting back from dropping off Peyton. But, of course our car chose that day to die on us. I had to call Tom to run over and jump the car, deposit Peyton at school and our nanny raced home to meet me so I could make it to Austen's doctor's appointment. Not sure how we did it but somehow we made it, and on time. Oh, and I forgot to mention our credit card company called - our card number was stolen during all of this. Fun! Long story, short - the orthopedist and his nurse were great. Austen got to select his cast color. 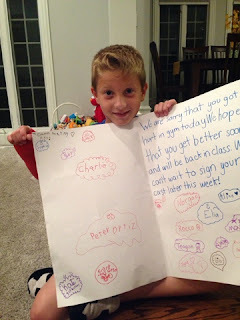 He chose red for his school (or Indiana!). These casts are waterproof these days so they don't even need to wrap it when showering. Nice! They also encouraged Austen to get right back into his activities and play. So no missing out on gym class, recess, flag football or soccer. I thought this was great and wanted to get him back to doing these things again because he seemed very cautious about doing so. So I sent him to soccer practice tonight and his coach said he looked like the same Austen out on the soccer field. His cast was not even a thought in his mind as he was playing. He was just playing his game. I'm so glad he was okay and that he's adjusting to buckling his seatbelt in the car, catching a football, buttoning his pants and other items that might require two good hands. And, I'm so glad that I'm still standing in one piece after all of this. 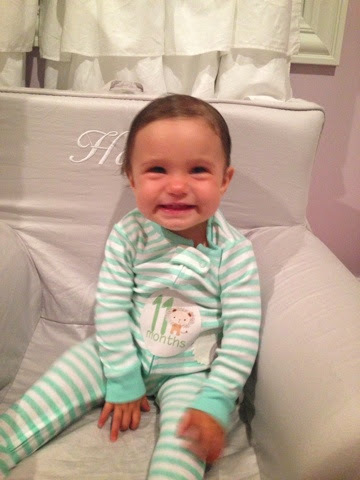 Hailey turned 11 months old last week and I am busy planning her first birthday party. One. I can hardly believe it. My baby turns 1 too soon. But we are enjoying watching her grow. This past month, she added another tooth. We are up to five now. Her first word was bye bye followed by mama, dada and uh-oh! She loves to play ball and has great eye-hand coordination like her brother. In fact, she has quite a throw already. She is getting fast crawling, learning to eat table food which she doesn't like the texture of and promptly spits out. This is a whole new world for me too. I have to teach her the Montessori ways of independence since she is not benefitting from being in that atmosphere at this age. Learning to drink from a cup, eating table food and socialization although I think she gets enough of that with her siblings! It will be interesting to see the difference between my Montessori and non Montessori kids! 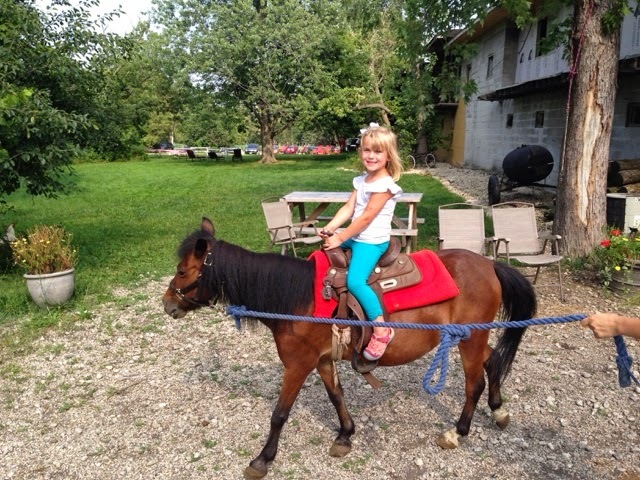 During the last few weeks of summer, Peyton kept asking to ride a horse. Don't all little girls love horses?! I know I did but I think I was much older. For some reason we live close to a number of stables so I looked a few up and we decided to take her. Now it wasn't a horse mind you since most are incredibly tall and she is 4. Plus I suspect she is a little scared of heights so thinking that combination wouldn't have been good. Anyway, we rented a pony. Literally. We pulled up. 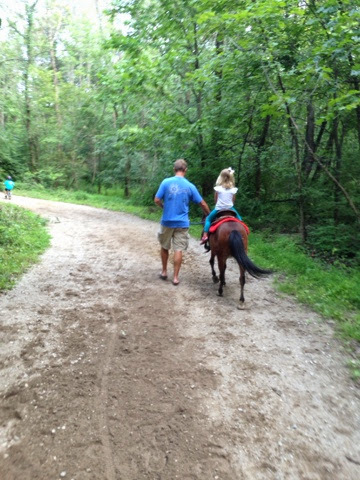 Handed them our money and they gave us the reins to the pony and said there are a lot of trails through the forest preserve that way and pointed us in the right direction. Her name was Rosie, and she didn't want to go for a pony ride. She wanted to stay and eat grass. If you tried to prevent her from eating grass she pushed you out of the way! We didn't want to alarm Peyton so we pretended this was normal and talked about how Rosie must not have had lunch. Peyton was a little nervous at first. She wanted to get off right away but somehow Tom and I convinced her to stay on, and once she relaxed, she actually began to enjoy the ride. She must have liked it because she talks about Rosie and asks to go back all the time. Next time I think we'll try a ring or a guide on a trail. The first days of school have come and gone. 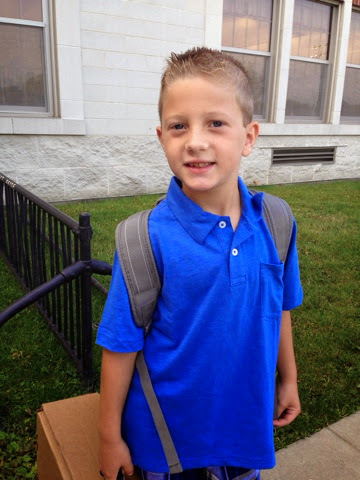 Austen was excited to start second grade. Second grade. I remember when I was in the second grade. It wasn't that long ago! Or maybe it was. At any rate, he loves his teacher, his friends and desperately wants me to let him walk home by himself. We are only about three blocks from school but still not old enough in my opinion! Next year you can, I tell him knowing I will probably meet him at the corner anyway and kids walk home in droves in our sleepy small town. 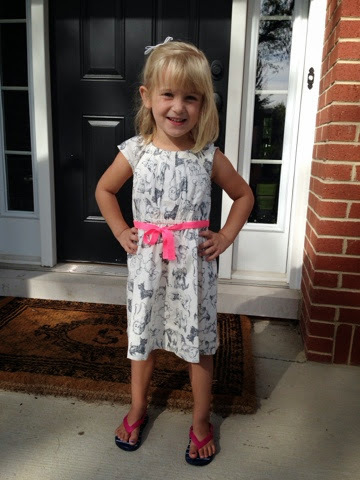 Peyton also had her first day and announced the goats and the chickens are back at her school. (Yes, they do have these animals and a bunny in their 'backyard'.) She talks about her good friends at school which is a change from last year where I had no idea who she played with that was her age. Since of course she mentioned only the big kids. Last year of 'preschool' before kindergarten next year. Good thing she insisted she also do homework like her brother. Good study habits start early!